You are here: Home / Blog / Misc / Are Bathroom Robots Taking Over the World? Maybe not quite yet taking over but we’re definitely on a brink. So far most attempts at creating a coherent and helpful housekeeping robot have been pretty weak. At the same time research never stops and here and there an odd high-quality robot pops up. Most recent developments in the exciting field of creating bathroom robots come from the Country of Rising Sun – Japan. The main motivation behind creating a perfect bathroom bot is the ageing population of Japan. It’s estimated that almost one quarter of the Japanese are 65 or older. With such ageing population and ever shrinking household sizes, it’s important to develop autonomous household chore machines that will help people stay independent longer and relieve the strain on the country’s social security system. Also it’s not some off-beat startups that are working on bathroom robots. Yes, there are still a lot of startups on this new emerging scene, however, big global corporations are now joining the race – Toyota amongst them. When it comes to bathroom and utility areas of your property, even fewer robots are available to pick up the tedious chores. One of the most popular is Roomba’s little brother Scooba 230. It’s made by the same company that the well-known Roomba and it’s specifically designed to keep your bathroom clean. Not only it cleans around the toilet, it also helps battle certain types of Staphylococcus bacteria. The biggest downside is that it doesn’t clean the toilet or the bath from the inside. Cue toilet cleaning robots. There are at least two working prototypes built so far – one at the University of Koblenz-Landau in Germany and another one at the Ariel University in Israel. Both concepts are quite similar – a robotic arm that does one of the most hated household jobs ever invented. Luckily these robots come with a camera and a sophisticated recognition device making sure you’re not disturbed when you’re in the middle of something. It is also capable of cleaning the bathroom floor. The only downside is that these robots are quite chunky – you can’t really justify keeping this whopper of a thing in your bathroom. 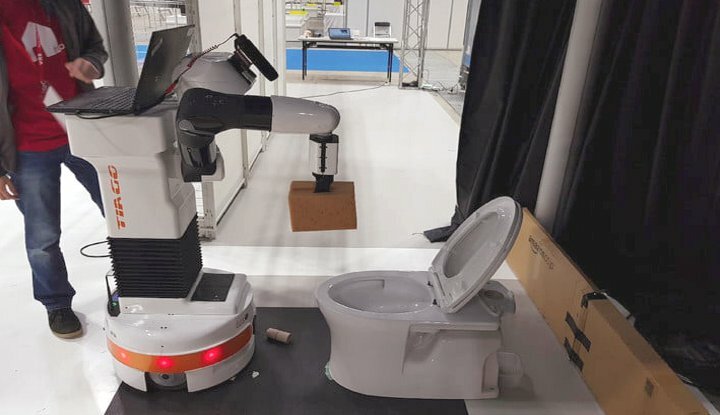 As it is, the toilet cleaning robot is also much slower and less thorough compared to a human cleaner. Besides, we need to be steering towards universal robots otherwise we will start building a separate robot for each domestic task. Like the (in)famous shirt folding robot presented at the Westworld TV in 2016. Another potential route for development of bathroom robots has been presented by the Japanese scientists – the Patient Transfer Assist bot can dip patients into baths and later extract them as well as help patients with using the toilet. Sounds like a much better way than using the traditional hoist mechanism currently employed by hospitals.